Was it just a dream…? Once the current cold spell is over perhaps Cleddau could resume her transport duties – and ferry her crew along the Upper Peak Forest Canal to Bugsworth for a spring weekend…? So wrote Boatwif, a couple of weeks ago, following the Isle of Wight escapade. And a miniscule spring cruise has happened – honest! After two nights aground in the Macclesfield Loft for the Library in the Landscape Affair (March 16th) Boatwif and the Captain took to the water. 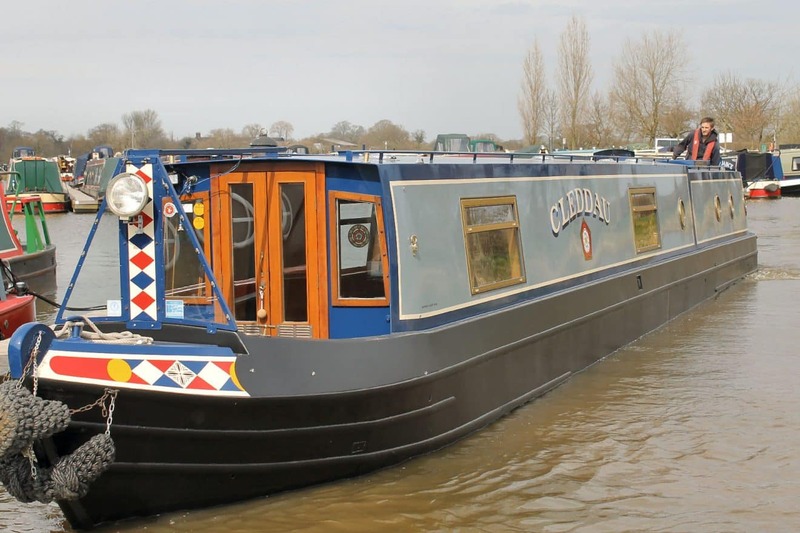 Cleddaulay cold and thirsty at her mooring on Sunday morning but after a reverse to the tap near Bailey’s Trading Post, a long wait for another boat to fill up and some thought-provoking conversations with boaters and passers-by*, it was time to cruise. Smoke curled from the multi-fuel stove below decks while crew on the stern were neither shivering nor encased in windproof layers, gloves or hats. Hope was in the air, hope of spring at last – and of a pub supper. On Sunday it was just a three mile or so cruise to Marple Junction where the Ring O’ Bells pub sits just alongside Bridge Number 2. Was food available? There had been a failed attempt here last September when the chef had been sent home early to pack for his holiday. Was history (ie. no food available) to be repeated. NOT SO! Eyes alighted on the Specials Board. Who would have thought that prawn and monkfish kebabs served on a bed of rice and accompanied by a small jug of mild curry sauce could be both visually appealing and extremely tasty. Full marks now to this hospitable eatery! Monday morning dawned, sunny, bright and clear. A return to moorings was essential but couldn’t there be a slight diversion first? Cleddaucrept up to the junction, ready to wind and return to base. The temptation was just too great to resist; it was a right hand turn onto the Peak Forest Canal. It was just a little cruise, just a mile or so, Cleddau ferrying her crew towards, though not to, Whaley Bridge and Bugsworth. Through the bare branches the clean lines of the Peak District hills were visible. and tree reflections shimmered in the water. All was well with the world andCleddau and her crew were afloat and in motion! The 60’ 6” of boat was turned where she had never been turned before. It was back to base then, a couple of hours away. Within a mile of the moorings winter was back with stinging raindrops and blustery winds. As Cleddau cruised past The Trading Post work at last was being started to repair the collapsed bank..
Decision time: should all the precious water in the tank stay or go? Could there be further cold weather this late in March?